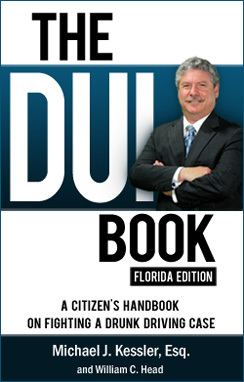 The DUI Book explains in plain, simple, easily understandable English the ins and outs of DUI in Florida. The book describes Florida’s legal processes and procedures pertaining to DUI, and provides straightforward answers to questions about DUI in Florida. The DUI Book is no substitute for having a licensed, experienced, knowledgeable and dedicated DUI defense attorney. It is, however, a helpful guide that you will find useful if you are charged with DUI in the state of Florida. To order The DUI Book, Florida Edition, by renowned Florida DUI Attorney Michael Kessler, at $99 per copy, contact Kessler Law Office directly by phone, 772-466-4900 or complete the form below.